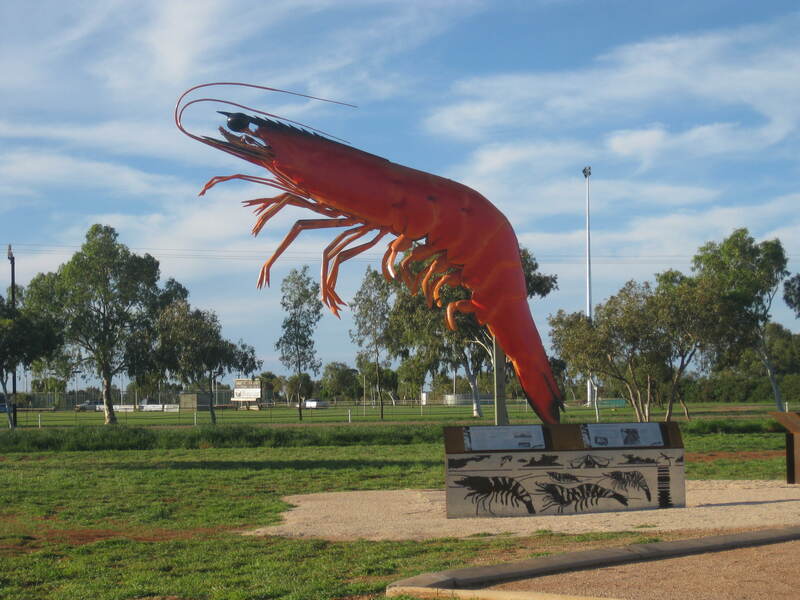 I found the big Prawn! I barbecued all by myself. Had barbecued pumpkin. Actual amazing. This will def be happening when I’m back in Scotland! I attained a bottom bunk AND a socket beside my bed. You have no idea how happy this combination made me! I found out what a Queensland Groper is. Don’t panic… It’s a very big fish! As a result of seeing ‘Saving Mister Banks’ I’ve been reading Mary Poppins on kindle. I got to the end of the book and found out there were 5 more… Who knew?! I now have 630 pages to go! Let’s hope it takes me less time than the hobbit on kindle took me to read…! I became part of the ‘Banana prawns’ (self made group name) during the Tuesday night pub quiz at Grace’s Tavern. Surprising ourselves with how well we did in the sport round, how many Australians did we know in the Australian picture round? One. Yes only one. Peter Andre… Extremely worrying ;-). Exmouth has been interesting… Not at all what I expected (a bit smaller and much more open space), my planned couple of days stop over turned into a week’s stay… Of course as usual timing it well arriving with a Friday/Monday public holiday, with job hunting to be done, I decided to give it some time before rushing north. A coin toss leading to my accommodation of choice, it has led to some interesting characters. EVERYONE I’ve met in Exmouth has been really nice. Two lovely Swedish girls have given me some much needed company. I’ve had a lovely chat about blogging with a nice Australian lass and a Frenchman taking all the penalty points because he thought you won that way during a game of cards provided much banter :-). The town makes it very easy for you to learn of its story. I’ve found it very interesting to learn of it. Built up around a naval communication station, commissioned as U.S. Naval Communication Station North West Cape in 1967, in 1968 it was renamed in honour of Harold E Holt, a former Australian prime minister who disappeared whilst swimming, presumed dead three months after the station was commissioned. Thirteen VLF towers stand at this station. Built so that the US navy could communicate with submerged submarines in the Indian and West Pacific Oceans. Not appearing too tall by sight, driving past them on the wide open land they stand on, the biggest (Tower Zero) is in fact bigger than both the Sydney and Eiffel Towers and is the second tallest structure in the Southern Hemisphere. There is also a shipwreck of the SS Mildura, which sits on the northernmost coast. Its wreck put some interesting consequences into action. Hitting the reef on the 8th March 1907, not badly damaged but unfortunately for its cattle bearing load who all died, it put the north west cape on the state government’s priority list for locations for lighthouses the night before the list of recommendations were due to be made. Hearing that Exmouth has had a bit of a tough time in the media recently due to flash floods (ok some roads in the national park are damaged), by no means has the whole town been washed away. The area looking, I believe, uncharacteristically very green, it offers an interesting visual contrast to Exmouth’s red rock background. Exmouth is definitely worth a stop on a road trip of the west coast. My guide book tells me it apparently attains 320 days of sunshine a year…! That is most definitely a pretty good bet for a nice day ;-). Glad I swung up this way, the people I’ve met and the banter we’ve had together have made it even better :-). Til next time :-).